A new Jedi Order in Darth Vader #14? Maybe not. 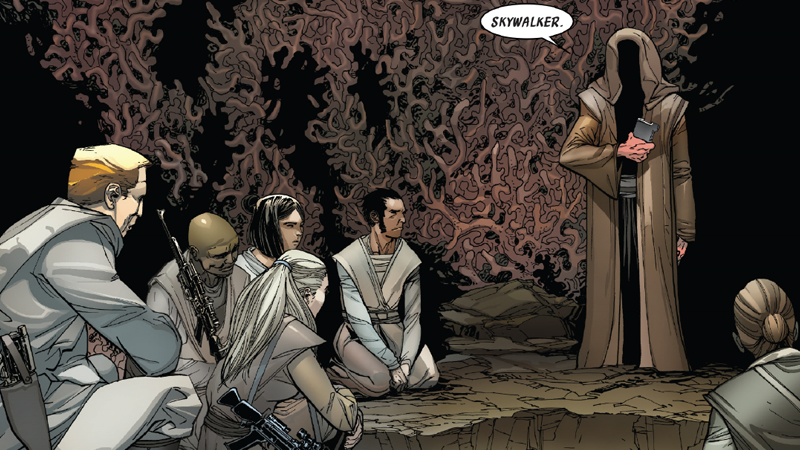 Set in the early days of the Empire, Marvel’s current Darth Vader comic has done some excellent worldbuilding to flesh out how the universe of the Star Wars prequels becomes the one we see in the original trilogy. One of the most fascinating ways it has done that has been through splintering what we once knew as the Jedi Order. As devastating as Palpatine’s Order 66 is to the Jedi in Revenge of the Sith, ancillary Star Wars material has spent decades after the movie reminding us that not every Jedi perished due to the command. Their central establishment, the Jedi Order, was—but individual Jedi themselves scattered across the galaxy into hiding, separate but united by one shared question: What happens to the Jedi next? While showing the early days of Anakin Skywalker’s rise as Darth Vader, Charles Soule and Giuseppe Camuncoli’s Vader series has also tackled this as framed through different Jedi which Vader himself has had to hunt down over the series. There was Kirak Infil’a—the Jedi Vader killed to earn the crystal for his Sith lightsaber—a lone exile who thinks he’s the only Jedi left, burdened with the grand task of restoring their light to the galaxy. Then, there was Jedi Librarian Jocasta Nu, who believed that it matters less that the Jedi Order is gone, and more that its knowledge should be saved so that a new generation of Force users that will someday rise can learn from it. Now, as the series moves towards depicting the Empire’s subjugation of Mon Cala in its latest arc, it’s given us a third former Jedi who raises even more intrigue: an Ikotchi Jedi named Barr. Some chatter has made its way online about Darth Vader #14—by Charles Soule, Giuseppe Camuncoli, Daniele Orlandi, and David Curiel—and how its introduction of Barr hiding away deep below Mon Cala’s surface also supposedly brought with it a secret new version of the Jedi Order. When Vader and the Empire begin their landing on the planet, we cut to Barr sensing the Dark Lord’s presence... but he’s not alone. Fake news exists even in the galaxy far, far away. They look like Jedi, down to the clothing, but that wouldn’t necessarily make this a new Order—unless we want to give any Jedi who group up after Order 66 like Kanan, Ezra, and Ahsoka did on Star Wars Rebels the honorary title of individual, new Orders too. But even in the brief time we spend with them, we get some indications that these aren’t the sort of Jedi we’re used to. They may not even be Jedi, full stop. First, from a visual standpoint, notice that all of these “Jedi” are packing heat. And specifically, none of them have lightsabers—they’ve all got blasters slung on shoulders and around their hips, which isn’t a very traditionally Jedi thing, unless every one of these survivors conveniently lost their lightsabers when they escaped Order 66. But when they start talking, it gets even more interesting: Barr doesn’t call Vader by his Sith name, at first, but instead refers to him as Anakin Skywalker... and these people don’t know who that is. Even the freshest youngling would’ve been aware of who the legendary Anakin Skywalker was by the time of Revenge of the Sith, surely? Relics from the lost age of... less than a decade ago. People in the Star Wars galaxy sure do forget things quickly. The idea of Barr abstracting Jedi to the wider concept of justice and resistance suddenly makes it feel like these people aren’t Jedi rebuilding a new Order—they may not even be Force users, we don’t know yet—but likely those angry at the Empire’s rule who’ve been taken under Barr’s wing. A single Jedi, acting as a figurehead of resistance to inspire other people in the Force’s name, perhaps—a new evolution of the Jedi as a concept, now that the Order as he knew it is no more, just as we’ve seen cropping up across this series before, on Rebels, and eventually in the original trilogy, with Obi-Wan and Yoda’s tutelage of Luke. We don’t know for sure if that’s the case, we’ll have to wait to see how the rest of this arc plays out. But for now, it’s hard to really call this a new Jedi Order when there’s plenty of hints that these are not quite the traditional Jedi we’d expect from one—they might be something entirely new. From the little we do see of them in Darth Vader #14, however, this group of Force users (or maybe non-Force users!) gives us some insight into how the removal of the Jedi Order from the Star Wars galaxy has already begun splintering what being a Jedi even means without it—an idea that we know that the movie saga itself is slowly beginning to play with itself. That’s honestly more fascinating than any secret new Jedi Order we’d know is doomed to fail could be in the first place, really.